9 Piece Stainless Bar Shakers. Set Includes 1) a Large 550ML Ounce Shaker; 2) Handy Double Jigger 20/40 Milliliters; 3) Multi-Function Waiter’s Friend Corkscrew; 4) Hawthorne Strainer; 5) Cheese Knife; 6) Bottle Opener; 7) Ice Tongs ; 8) Cocktail Spoon; 9) Storage Rack – Attractive Box Perfect for Gifting. Simple and Easy to Use.The Bartender Tools are recommended for beginner’s and experienced bartender alike. Experience the improved taste of a large variety of spirits like Tequila, Rum, Vodka, and Liqueurs like never before. It’s certain to be the most used piece of your barware arsenal! 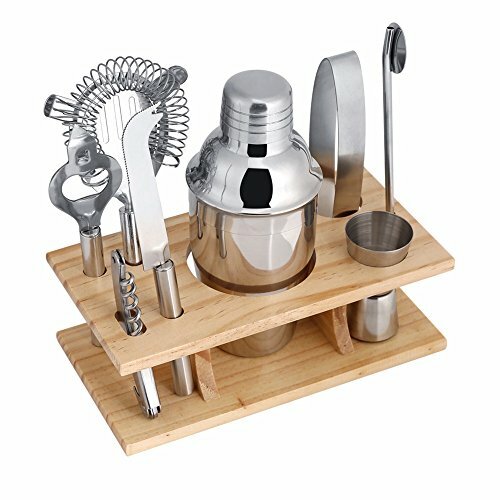 Premium Quality Mixology Set .All the bartender tools was made of stainless steel, elegant appearance, non-toxic, solid and durable. The seal of the shaker is of good quality, it won’t cause any leakage of drink. This Bar Set is Perfect for Parties.Impress your friends with your bar kit and every piece you’ll ever need to make drinks and cocktails. And after the part, everything is easy to clean and dishwasher safe. 3 Months No-Chip Warranty – Your purchase is backed by our exclusive 3-months No-Chip warranty – Fecihor will offer a free replacement or refund if any quality problems on this cocktail set. That’s ZERO risk!